President Recep Tayyip Erdoğan has said Russia will lose "a lot" if it loses Turkey as a friend. His comments came Tuesday in the aftermath of a Russian fighter jet's violation of Turkish airspace over the weekend, which put ties between Moscow and Ankara under a spotlight. 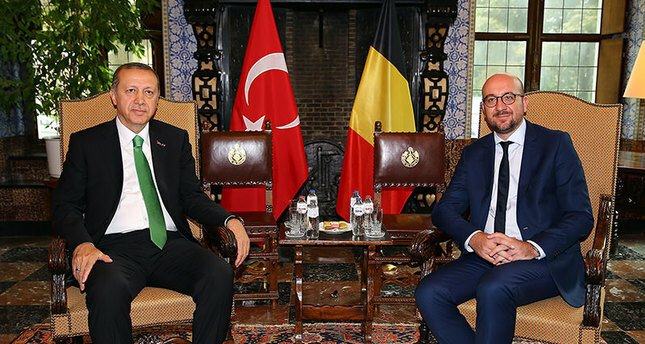 Addressing a joint press conference with Belgian Prime Minister Charles Michel in Brussels, Erdoğan said: "If Russia loses a friend like Turkey with which it has conducted much business, it will lose a lot." He also highlighted Turkey's membership in NATO and said "an attack on Turkey is also an attack on NATO." The Russian presidential press secretary said in reply to criticism from Turkey and other NATO members that relations between Ankara and Moscow will not be affected by Russia's recent airstrikes in Syria. "Our bilateral relations with Turkey are quite comprehensive and based on strong grounds," Dmitry Peskov told the media in Moscow, adding that he did not think bilateral relations would be "badly affected" by the airstrikes. About the Russian fighter jet's violation of Turkish airspace on Saturday, Peskov said: "Our ambassador [in Ankara] was summoned to the Foreign Ministry and given a note, which we will check." In his toughest remarks yet against Russia in the current crisis, Erdoğan accused Moscow and its ally Iran of working to maintain the "state terror" of Syrian President Bashar Assad, whose military forces have killed over 300,000 people since the beginning of the civil war. "It is of course not possible to remain patient about this," Erdoğan said, referring to the incursions into Turkish airspace. NATO allies said Monday they "strongly protest" the violations by Russia and cited the "extreme danger of such irresponsible behavior." U.S. Defense Secretary Ashton Carter called on Moscow on Tuesday to urgently respond to proposed rules for air-to-air conduct over Syria, as he condemned Russia's "seriously irresponsible and unprofessional" violation of Turkish airspace. U.S. and Russian militaries held a secure video conference last week in which Pentagon officials suggested protocols aimed at preventing a mishap as the former Cold War foes carry out rival campaigns of airstrikes in Syria. But since then, Moscow has failed to follow-up, Carter said. "We are waiting for the Russians. They owe us a response," Carter told reporters as he visited Moron Air Base in Spain. "They should come in and do it right now." The U.S. fiercely opposes Moscow's support for Assad and accuses Moscow of mainly targeting other insurgents who oppose Assad, rather than ISIS. Carter said Moscow's strategy to bolster Assad would backfire. "In Syria, they are going to be checked in the first instance by the backlash that they're going to get on account of siding with Assad against everyone else," Carter said. The Foreign Ministry on Monday summoned the Russian ambassador over the airspace violation. Prime Minister Ahmet Davutoğlu indicated that "the incident occurred by mistake." Two Russian jets operating in Syria violated Turkish airspace in separate incidents over the weekend, and Turkey repeatedly summoned the Russian ambassador for explanations. Speaking in a live interview, Davutoğlu said Turkey's rules of engagement were clear about whoever violates its airspace. He said Turkey maintains the right to take military action against any object that enters its territory. "I should express it clearly, even if it is Syria, Russia or any other country's planes, Turkey's military engagement rules are valid for all," Davutoğlu said. Davutoğlu also said Russia assured Turkey that its airspace would not be violated again. The Russian Embassy in Ankara admitted that Russian aircrafts violated Turkish airspace. "Such an incident actually took place," embassy spokesman Igor Mityakov said, and added: "As far as I know, explanations about this matter were given to a military attaché at the Turkish Embassy in Moscow."